First transmitted in 1968, John Betjeman takes a journey from Marble Arch to Edgware talking about buildings of interest and reciting four specially written poems along the way. First transmitted in 1968, the poet John Betjeman goes on a journey from Marble Arch to Edgware reciting four specially written poems: 'How beautiful the London air,' 'Ho for the Kilburn High Road,' 'The sisters Progress and Destruction dwell' and 'One after one rise these empty consecutives'. Along the way he pauses at places of interest such as the hidden Marble Arch police station from where, since 1851, a hundred policemen could lie in wait ready to emerge at the first hint of trouble. After bemoaning the loss of the Metropolitan Theatre of Variety to make way for a car park and reminiscing about the 1920s air pageants from Hendon Aerodrome, Betjeman arrives "at Edgware, a Middlesex small town that was." This programme is part of a collection of BBC programmes celebrating the people and places of London. Available online now. 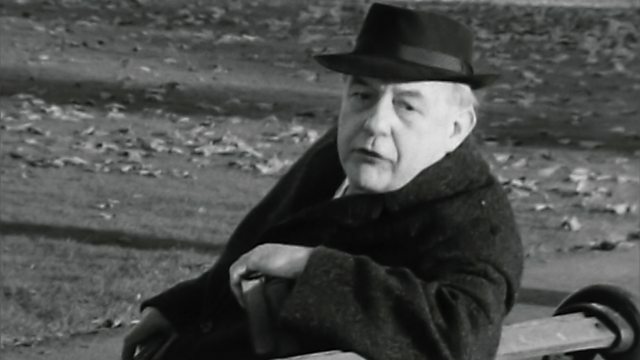 Rediscover the documentaries that made Betjeman a much-loved figure on British television. The documentaries that made Betjeman a much-loved figure on British television. A collection of BBC programmes celebrating the people, places and spaces of London.